Bud Spencer – The Incarnation of the "Haudrauf-Film"
In the year of 2016, many beloved celebrities have gone, for example, the singer Prince or Lemmy from Motörhead. But another man died who was something like an icon for many people, not only in Germany. Bud Spencer died on June 27th. But his movies, his bon mots and all in all his life’s work will remain unforgotten. Let’s take a look back on his efforts and try to understand why he was such a beloved person for many Germans. Bud Spencer was born in 1929 as Carlo Pedersoli in Naples, Italy. Unlike his later appearance, he soon became very successful in sports, especially in swimming. He was a tall and athletic young man who gained many successes in the water. In 1949, the 20-years old Carlo won the national swimming championship, later he even became part of the Italian Olympic team and succeeded in the games of 1952 in Helsinki, 1956 in Melbourne and 1960 in Rome. But not only swimming was his big talent, but also in water polo (or in German, Wasserball). One of his greatest efforts in this game was winning the Italian championship with his team S.S. Lazio Rome and also winning a gold medal in the Mediterranean Games of 1955. These movies are still all-time-classics and many people, also the youngsters, have seen them and can quote at least one sentence. Their extreme way of beating up people by making it look slapstick-like also influenced the German language today: The verb “Budspencern” means to beat up a group of people in a superior and somehow comical way. Although Bud Spencer started many other projects in his later life like becoming a politician, it is the movies that made him well-known around the world and especially in Europe. Many young people even admire him in the way of a cult that made him somehow iconic. As the city of Schwäbisch Gmünd asked the citizens for a name for a new to build a tunnel, of course, the suggestion “Bud-Spencer-Tunnel” won the polling. 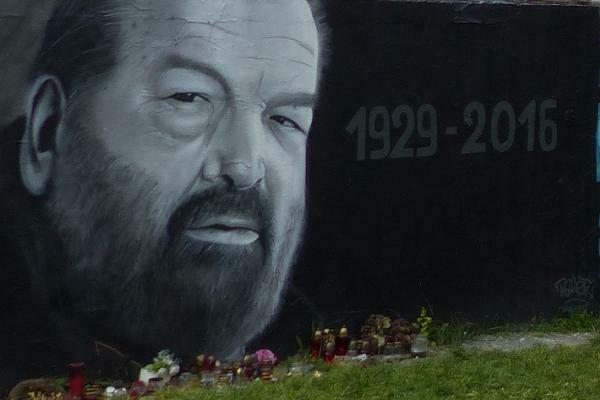 Thus, the city council refused to name the tunnel after Pedersoli but gave their public swimming pool his name: it is now known as the Bud-Spencer-Bad. Also, a hill near the city is now called Terrance Hill. But with all this honoring, Bud Spencer remained a modest man until his death. That’s one reason why so many people still admire him so much. German up to level B1 easily. Get to know powerful learning techniques useful also for B2 level. Learn to organize your German learning efficiently and effectively to benefit for years to come.